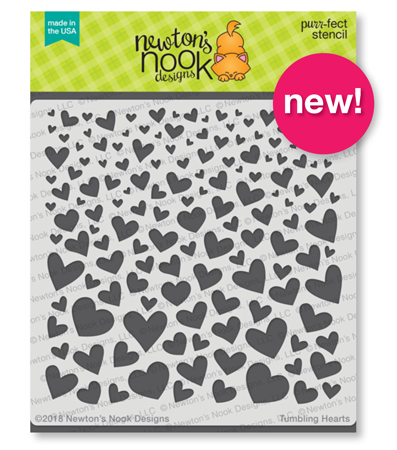 Newton's Nook Designs: January Reveals - Day 1 - Love Bites Stamp Set + New Stencil! January Reveals - Day 1 - Love Bites Stamp Set + New Stencil! Today is the first reveal day for our January Release! 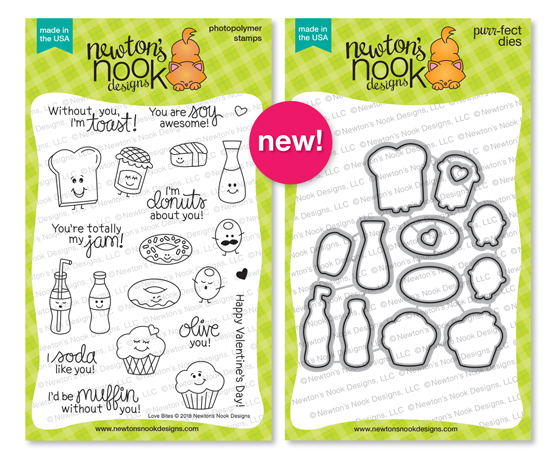 This month we are releasing FOUR adorable new stamp sets with coordinating dies and one new stencil too! 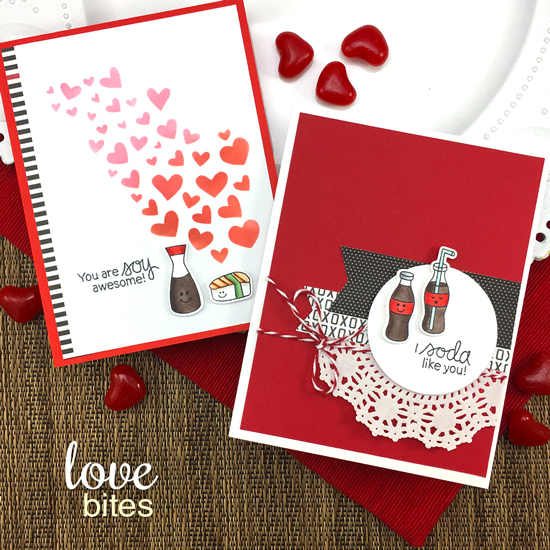 Today we are featuring an adorable new foodie Valentine stamp and die set called Love Bites and our brand new Tumbling Hearts Stencil! We are giving the Love Bites stamp set away one lucky winner so make sure you read all the way to the bottom of this post to see how to win! You'll adore these cute Valentine and love cards by our Design Team! 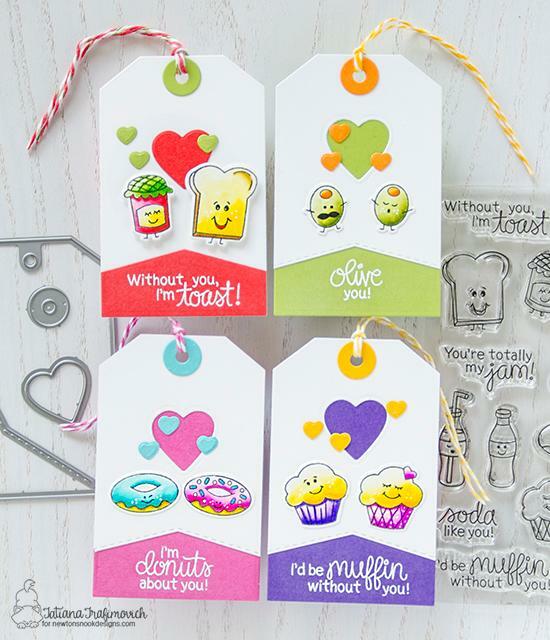 Tatiana created a fun set of tags using all the cute little food couples from this set along with the Fancy Edges Tag Die Set! These would be so fun to tie onto Valentine's Day treats! The sushi and soy sauce pair so perfectly together on this cheerful card by Naki! This card is perfect for sending to a friend who you think is awesome! 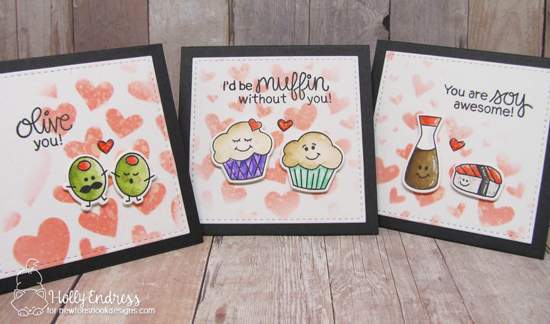 Juliana created a trio of adorable square cards featuring the sweet food couples. 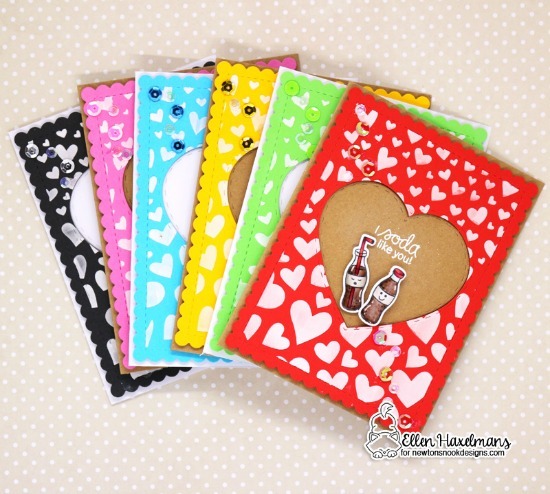 She also used the new Tumbling Hearts Stencil to create lovely heart backgrounds for each card! This card by Larissa is so yummy! 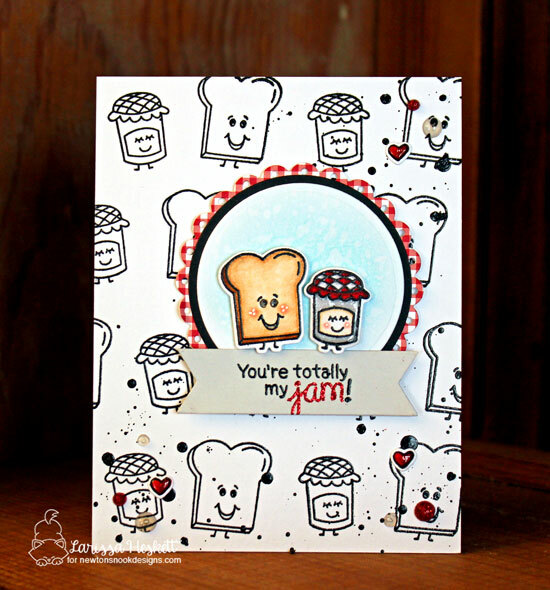 She stamped a fun background using the toast and jam in simple black and white and then colored them for the center image! So cute! 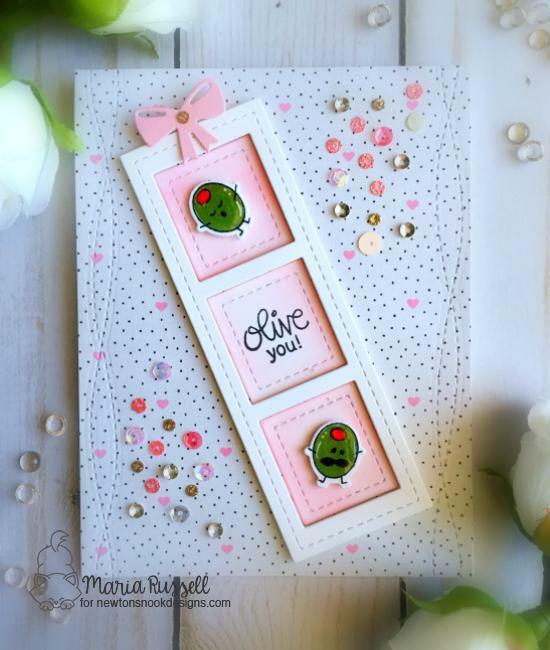 The cute little olives really pop on this card by Maria! It's so cute how she put them inside a trio of squares and added the bow from our Pines & Holly Die Set on the top! Maria has a couple more cards on her blog today so make sure to head over there to see them! 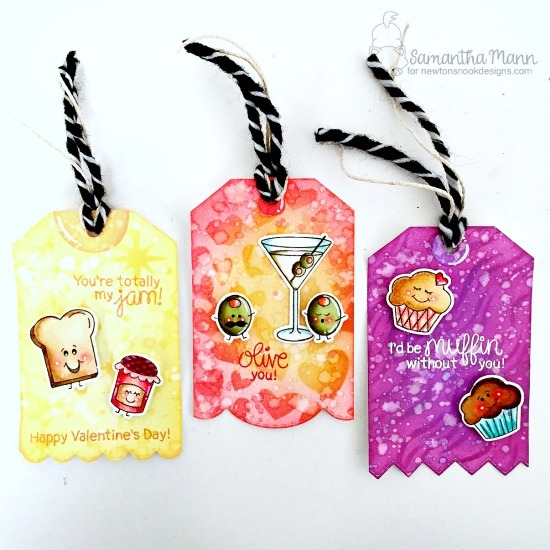 This trio of tags by Samantha is so awesome! She used the cute food couples from the new Love Bites Stamp Set and added in a the martini glass from the Cocktail Mixer Stamp Set. She created backgrounds using several of our stencils and used the Fancy Edges Tag Die Set to cut out those pretty tag shapes! 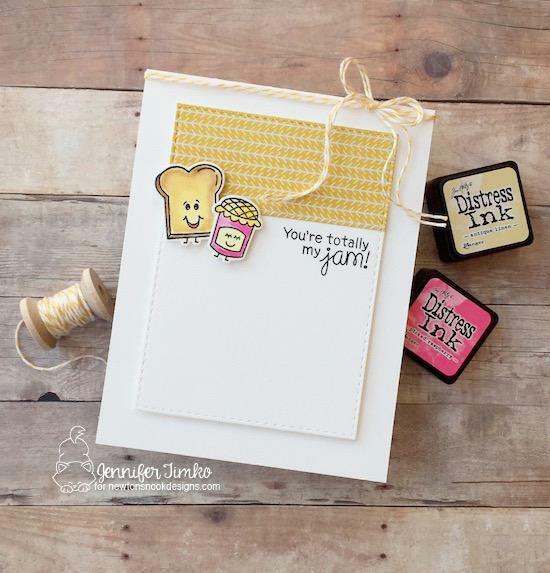 This clean and simple card by Jennifer will definitely make you smile! the toast and jam really pop off that white background! 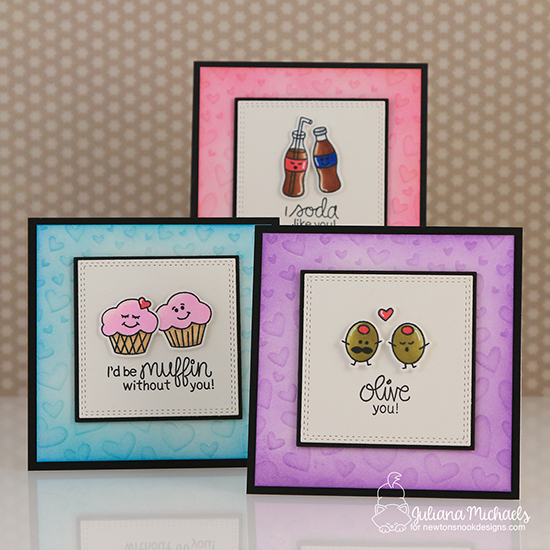 Holly created this cute trio of mini cards using the cute couples from the new Love Bites Stamp Set. She paired them with their food puns and used the Tumbling Hearts Stencil to add some hearts behind each cute couple! Ellen created a whole set of cards using the cute food couples! Each card features a different couple inside a heart. She used the new Tumbling Hearts Stencil to created the heart background patterns and the Frames & Flags Die Set to cut out the scalloped edge frames. Check out her blog to see more photos of her projects today! This looks spectacular! The olives are soooo cute!! Oh those are so very nice! and team made so wonderful inspiration projects! These are so punny and fun! Love 'em! Great inspiration from these amazing artists! This is the cutest stamp set and everyone did a fabulous job of showcasing it. I love Suuushiiii <3 Super cute! What a fun set of Valentines! These couples are so sweet and adorable! Not saying that super simple to color and use!!! Love this cute set!!! Everyone's cards & tags are so cuuute! Love all this adorableness!! The little faces are so cute! Love the creativity in these. This set is so fun! I especially love the muffin sentiment! The stamps are adorable! I really love the rainbow heart flow on your card Jennifer!! I think I will have again plenty fun going over the blogs ! This release looks again really fantastic. Wow, the whole team did an amazing job on the cards and tags, what a fun stamp set and love the stencil! Can't wait to see all the DT projects. Off to the hop. These are fantastic! I can't wait til Friday when these can jump into my cart! Very cute set and love the puns! Darling cards! Love the punny sentiments! Awesome stamp set, love those sentiments:-) And such a sweet stencil. CUTE cards , Love the punny sentiments! Very cute and funny set and love the tumbling hearts. The bloggers making tags with this set is so adorable. That stamp set with the sweet fun sentiments is so cute. I love smiley faces on food (or anything) - these stamps make me smile from ear to ear! Love your cute cards, Jen! That stencil is awesome! Super fun release, I love love love that sushi and shiyo stamp, so cute! Olive it! Really! Love that tumbling hearts stencil, too! A little behind to the party and just worked my way backwards. This is a fantastic punny set. Olive all of it! 😂 Fabulous DT projects. I don’t do Valentine’s and thought I would be saving some $ this month, but seeing this release so far messed up that plan. The heart stencil and Love Bites stamp set are both really cool. Thanks for the fun design team inspiration. This set is too cute! Love the stencil too! Fabulous projects! Oh my goodness your cards and tags are just adorable! Those little olives have just danced right into my heart! That stamp set is so cute! I love all the creations shown! Super clever is all I can say about these dies that go with this stamp set!!!! These new products are soo lovely !